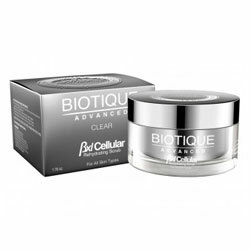 Buy Biotique Advanced BXL Cellular Rehydrating Scrub - 100% Natural lifts impurities & dead skin cells, unclogs & visibly tightens pores. 100% Natural lifts impurities and dead skin cells, unclogs and visibly tightens pores. This rich, water-activated formula lifts impurities and dead skin cells, unclogs and visibly tightens pores. Leaves skin pure, clarified and comfortable. Powered by exclusive BXL Complex for the most energizing, nourishing and strengthening skin effects.